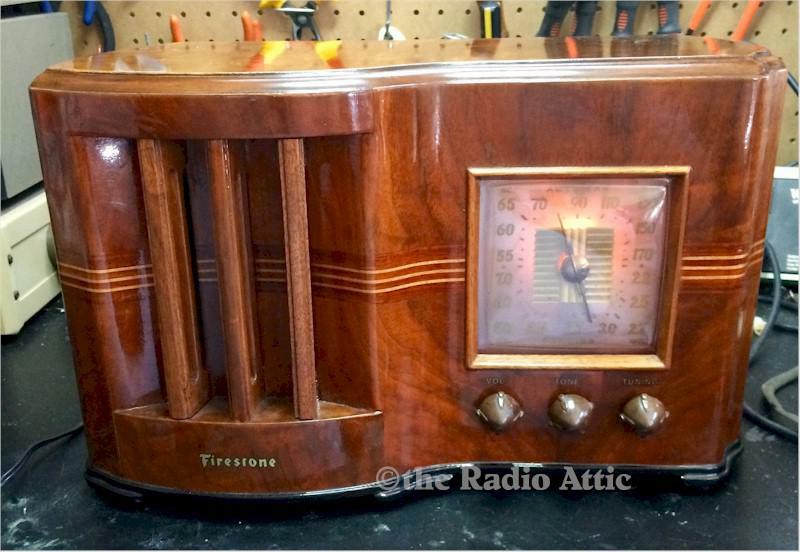 I really like Firestone "Air Chief" table radios, and I have several in my collection. This six-tube, two-band (SB, SW) radio, referred to as "The Stratford," was the first one I collected. It features a beautiful and unique Ingraham cabinet, and Gary refinished this radio pretty close to factory original. The radio is a burled walnut with a high-gloss lacquer finish, and is one of the more popular models with collectors. I went through this radio and replaced all of the capacitors, checked and replaced resistors and tubes, installed a new power cord, dial cover, re-coned speaker and a new reproduction back. The radio was aligned and performs strong across the dial, utilizing an internal loop antenna. 14"W x 8"H x 8"D.
You are visitor number 1,270 to this page.